I often struggle to find the time to plan our meals, because life has a habit of getting in the way. Everyone still needs feeding, whether or not I’ve had the chance to read, plan, shop or cook. Who knew? However, I do think planning meals, and adapting my shopping accordingly, can lead to lower bills. While trying to cut our food costs in February, here’s how I came up with a rough and ready meal plan. The big idea was use up food we already had in the house, and only buy the extra items needed for those meals. I therefore started with a quick stock take, looking in the cupboards, fridge and freezer to remind myself of what was available. At first glance, the answer was “not much”, but I did come up with some ideas. Prawn stir fry with noodles. The bonus with this meal was that we had all the ingredients anyway. Based on my shopping so far in February, I had already stashed a yellow-stickered pack of prawns in the freezer, which could be stir fried with green and red peppers, onion, carrot, broccoli and garlic. I could then add root ginger, soy sauce and egg noodles from the store cupboard. Friday night pizzas are a staple in our house. I already have most of the ingredients we use – value range mozzarella, cheddar, tomato puree, red pesto, strong white flour and a yeast sachet – and would just need to buy some black olives and ham for extra toppings. I plan to use some of my yellow-stickered bargains from the Co-op for a weekend lunch – the hefty whole chicken and swede, parsnip and carrots from the stew pack – plus potatoes from the massive sack I bought at the start. From the stores I’ll need a lemon, garlic and parsley from the garden, plus my daughter’s favourite chicken gravy pot. My son has developed a taste for tinned fish, after scoffing a tin of sardines in tomato sauce, and decided to start one morning by opening a tin of anchovies. One cut finger and a plaster later, and I have an open tin of anchovies to use up. The combination of anchovies and the black olives I needed to buy for the pizzas made me think of pasta puttanesca. It’s a quick and easy recipe with strong flavours, based on long-lasting store cupboard ingredients. I already have chilli flakes, olive oil, tinned tomatoes and capers, and could grab some flat leaf parsley from the garden. Although I don’t have enough spaghetti left for two people, I could bulk it out with a part-opened pack of penne. Sorted. I have a combination of real chicken and Quorn chicken pieces in the freezer, which I think are destined for a curry, potentially with the addition of the cut-price cauliflower, tinned potatoes, yellow split peas and rice that needs using up. I already have the remains of some Patak’s curry pastes in the fridge, but will need to check if any other specific ingredients are needed. I bought a tin of kidney beans thinking I’d make chill with some mince in the freezer – only to discover we didn’t have any mince left. #planningfail. So instead, I fancy making Jack Monroe’s carrot, cumin and kidney beans burgers, eaten in buns with iceberg lettuce, tomato and mango chutney. The only thing I need to buy is the wholemeal rolls. We don’t have enough eggs for quiche, but I do have puff pastry in the freezer, a couple of rashers of bacon and a tired leek that need using up. By softening the leek with onion and adding grated cheese, I can make a quick light and tasty tart suitable for packed lunches. Feta, pea and courgette fritters with salad. I’d already bought some value range feta and a courgette, intending to make these fritters for a light meal, but hadn’t got round to it yet. It would use up the last egg and couple of spring onions with the flour, milk and peas we already have. I’ve been hoarding veg that would otherwise go in the bin – broccoli stalks, feathery ends of celery, the outer leaves from the cauliflower and carrot peelings. I reckon I now have enough to supplement with potatoes and a veg stock cube as leftover stalks and leaves soup. If it makes it more palatable, just think of it as winter veg soup. Macaroni cheese is one of my stalwart recipes when children come round to play, which makes it handy during half term, and any leftovers go down well as my husband’s packed lunch. I’ve got enough cheese, butter and milk in the fridge, and could raid the store cupboard for flour and macaroni. I also add frozen peas to macaroni, in an attempt to get my kids to eat more veg, plus a crunchy topping, made from breadcrumbs from leftover crusts. I have half a pack of tortilla wraps left to use up. The children like “crispy triangles” as they call them, when you sandwich grated cheese and chopped ham between two tortillas, dry fry it in a frying pan so the cheese melts and the wraps go crispy, and chop into triangles. I still have half a pack of frankfurters in the freezer from earlier in February, so could either make mini toad in the hole again, or serve them with mashed potatoes from the sack, gravy and cooked carrots. We have double cream left over from the bread and butter pudding when the cousins came. SMoked salmon is one of the few fish my daughter will eat, so if I can find some on offer, I can make creamy salmon pasta and peas with the addition of some pasta, frozen peas, grated hard cheese and lemon zest from the stores. We’re planning some outings during half term, so I need some options for packed lunches. We already have a tub of soft cheese, so if there’s any smoked salmon left over and I buy some bagels, we have an alternative to standard sandwiches. If I buy ham and a wholemeal loaf, I can also churn out assorted sandwiches for packed lunches too, supplemented with the cucumber and tomato I bought last week. 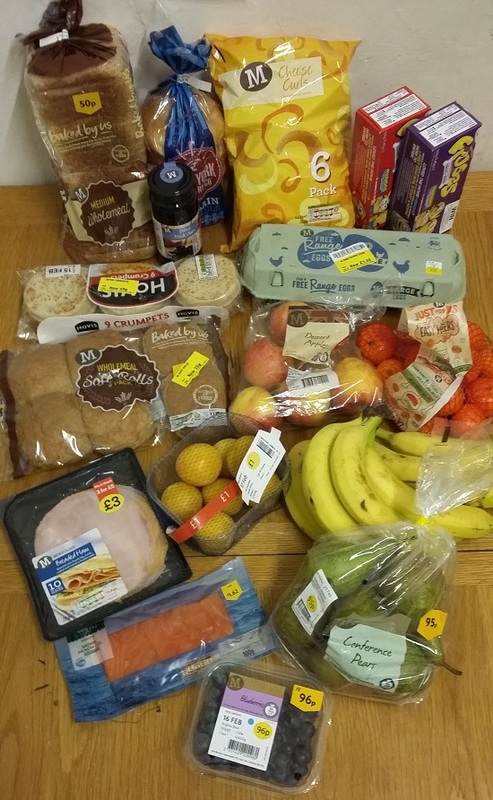 I’ve posted a picture of the shopping I ended up buying at the top of this post – £18.02 in total. Apart from milk, I’m hoping this will get us through most of the week. When I got to Morrisons, I had a look in the reduced section and also picked up a dozen cut-price free-range eggs for £1.35, which will help with omelettes and baking, plus a pack of 9 Hovis crumpets reduced to 49p which will go in the freezer. I even found a pack of six wholemeal rolls, which were on my list, down to 25p. Any top tips for making meal planning easy? Next Post Is Degustabox good value?